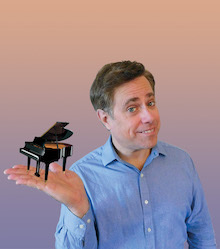 Bring the Piano by True Enough Productions at the 2018 Toronto Fringe Festival is a collection of stories and songs by travelling singer/songwriter Randy Vancourt (YTV’s Don’t Lick the Pig and Dudley the Dragon). It’s safe to say that Randy Vancourt definitely brought the piano. It takes guts to write and perform your own one man show, and Randy Vancourt delivered a well thought out, anecdotal, supremely interesting 80 minutes. Not only is he an outstanding piano player, but he has some fascinating stories, told in a way that make you feel like you’re experiencing it right there with him. From being dragged by the back of a train or corralling a pig inside a port-a-potty, I could easily imagine these stories, and was engaged the entire time. Some stand out moments were songs such as “Only One Fart,” a song from the perspective of a fart; “I Was Drunk,” a morning after love song and “Sometimes it’s Hard to Say Goodbye,” a song about well…stalking. Randy has been through some stuff. His confessionals were charming, sometimes strange, but always ended on a hilarious note. His demeanour was refreshingly humble and modest throughout. He wasn’t trying to impress you with any flashy wha-bams; his funny quips, endearing stories and expert piano playing was enough to entertain. I looked around me and saw the audience smiling for the majority of the time. Although the songs are funny and the stories are wholly engaging, there are a few technical things to point out. I found it was hard to hear sometimes – perhaps a mic or vocal projection issue, but I sometimes found myself straining at points. I also wish that the stories were told a little slower, some parts whizzed by me too quickly. Overall, Bring the Piano reminds you of the little things, the funny moments that make life so interesting. Randy takes you on a musical journey through his travelling songwriting career, and it doesn’t disappoint. Check it out at the 2018 Toronto Fringe Festival if you can! Photo of Randy Vancourt provided by the company.